The Direct Marketing Organization (DMA) is the trade association for companies that advertise by paper junk mail. They were the driving force behind the weak opt-out CAN SPAM act, which kept a much stronger California law from going into effect. For a while about a decade ago it sponsored a useless do-not-spam database which was supposed to solve the spam problem. 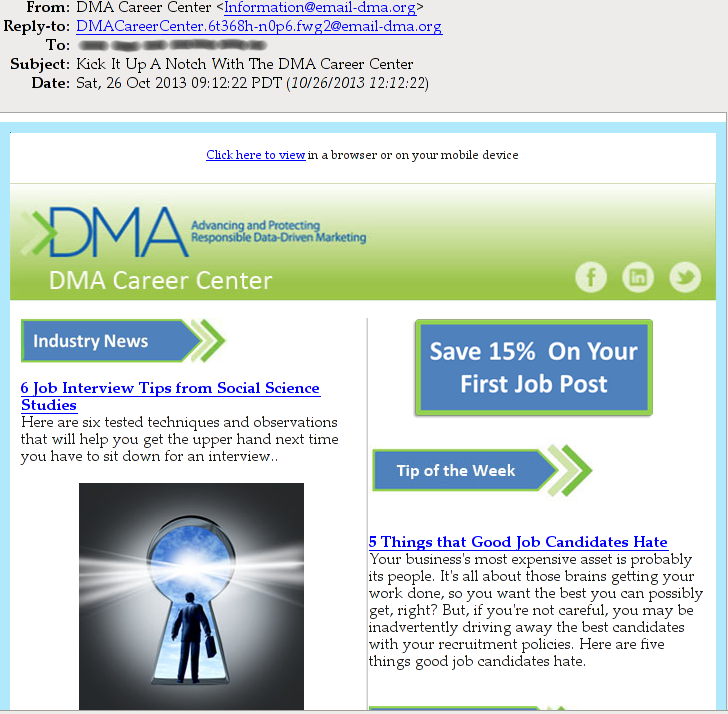 But yesterday, the DMA reminded us how well they really understand e-mail marketing. A lot of people (including me) are pretty upset at revelations of the breadth and scale of NSA spying on the Internet, which has created a great deal of ill will toward the US government? Will this be a turning point in Internet Governance? No, smoke will continue to be blown and nothing will happen. Recent press reports say that Silk Road, an online marketplace for illegal goods, was shut down by the FBI, who seized the servers and about 26,000 bitcoins in multiple wallets. They also apparently have all of the site's records of transactions among about 4,000 sellers and 150,000 buyers. If you're one of these buyers or sellers, now what?